In 1843, Strathbogie Church or the “New Church” as it was known opened for worship. Two years later it joined the Free Church to become Huntly Free Church. In 1900 it changed again to become Strathbogie United Free Church. Following it’s reconciliation with The Church of Scotland in 1929 it became Strathbogie Church of Scotland, Huntly. Successful evangelical work sponsored by the Duchess of Gordon saw the church building physically grow and by 1877 the tower, bell, clock and hall were added. By 1912 the north gable was extended to accommodate the organ which had been installed in 1904. A church has actually existed in Drumblade since the early 12th century. The building erected after the Reformation was rebuilt in 1773 with modifications being made around the same time as those at Strathbogie. The two parishes were first linked under one ministry in 1975. In 2008 the congregations united to become Strathbogie Drumblade. 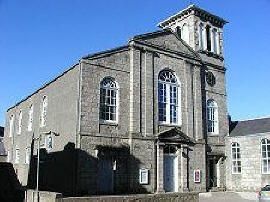 Sadly, the Drumblade building has recently been sold, with all worship being held in Huntly.